Beautiful Tracey. I love how you made the yellow the primary color to soften the color palette just a touch. Super pretty Tracey! Love the blooms! Lovely sympathy car. gorgeous card.. love the layers of flowers..
Soft and sweet Tracey, love this! 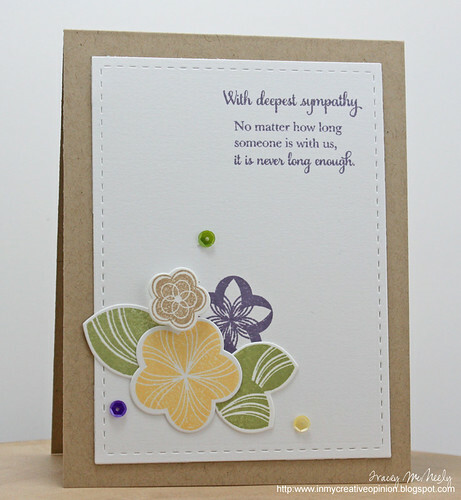 Very beautiful and comforting sympathy card. 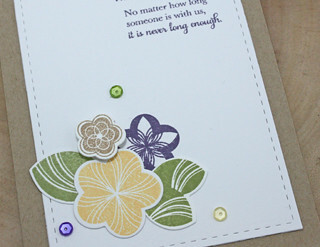 The craft card base really softens everything up, and I like how you used the purple for your sentiment. Soft and gentle, just as a sympathy card should be. And the sentiment...I feel the tears brimming. You will touch the heart of whoever needs their loss acknowledged. Stunning and special! Why did I not buy this set after the last time you used it? Kicking myself again.. you make this set a MUST HAVE! These PTI flowers are quickly becoming a fave for me...and I love how you played with the colors! Such a beautiful card, Tracey! Wow...just gorgeous and perfect for a sympathy card. 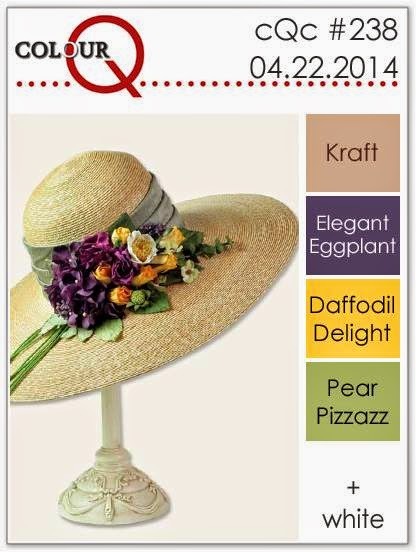 Love the colors this week too, they look amazing using the Ruby Reprise stamps. You used the colors in such a perfect way. It's lovely. This is so pretty. And that sentiment is so poignant. Such a lovely sympathy card, Tracey. I really like those flower stamps - cool pattern on them. So pretty Tracey. Love the colors together and the sequins.